Barred owl at the Blackland Prairie Raptor Center in Lucas. This is first in a series of North Texas Wild columns about wildlife rescue centers in North Texas. Photos courtesy of BPRC. John D’Amanda had been watching the injured bird for some time. A retired doctor, he’d seen the red-tailed hawk perched in the lower limbs of trees near his Little Elm area home. At times another bird seemed to bring it food. He watched every day, silently rooting for the bird, and called the Blackland Prairie Raptor Center in Collin County for advice. He even approached the bird at a distance and spoke soft words of encouragement. 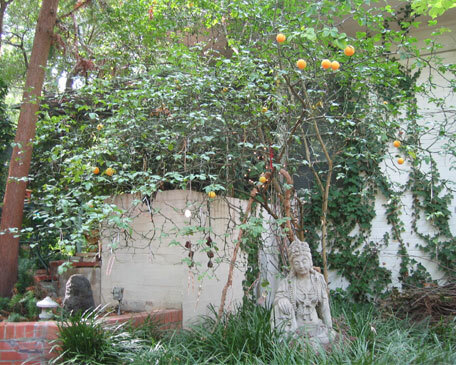 One day D’Amanda noticed the ailing bird standing on the ground, no longer able to reach or hold onto low branches. Using the same soft voice, he came near with a large towel and swiftly wrapped it. With the help of wife Linda, they sprinted to BPRC where raptor rehabilitators were waiting. On a Second Saturday event some time later, the only day BPRC is open to the public, D’Amanda attends in hopes of getting a glimpse of the bird he helped save. Liz Dunn, BPRC rehabilitation manager, offers us a visit to see the bird’s daily wound treatment in the center’s new Jess Glotzbach Medical Clinic, named for the president of the board of directors. D’Amanda had been keeping track of the mid-sized female red-tailed hawk. 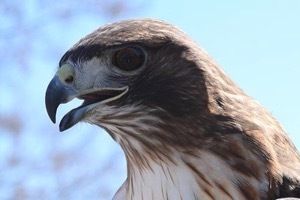 Those who rescue a bird can monitor its injury, treatment and prognosis via the Raptor Med program at BPRC’s website. But here in the clinic, he sees an unposted close-up photo of the bird’s injured claw and its cause: a metal pellet from a shotgun or BB gun. A volunteer brings in the bird swaddled in a towel with its head covered. Dunn cuts the blue wrap from the bird’s bright yellow claw skin and examines the wound site. 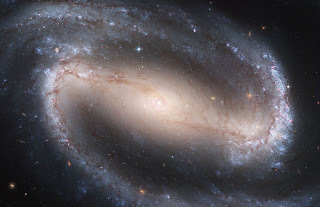 As John and his wife peer with fascination, she cleans the puncture and pushes out pus from several directions for a long time — the infection is piercing and pervasive. Dunn delicately cuts skin necrosis, applies antiseptic and new bandages, and bundles the bird back up for transfer back to the bird infirmary. BPRC volunteers have a combined total of more than 30 years experience presenting raptor outreach programs and well over 70 years of raptor rehabilitation experience. Whatever their raptor passion and skills, Dunn advises, all volunteers start with cage cleaning, aka poop patrol. BPRC opened its rehabilitation clinic in the summer of 2015 anticipating a few dozen birds. It was their first year, after all, and Rogers Wildlife Rehabilitation Center in Hutchins had been ably taking in raptors for decades, though that’s a long distance for those in North Dallas and Collin County. Screech owl at Blackland Prairie Raptor Center. So far, BPRC has received over 350 patients. More than 120 eastern screech owls top the list. 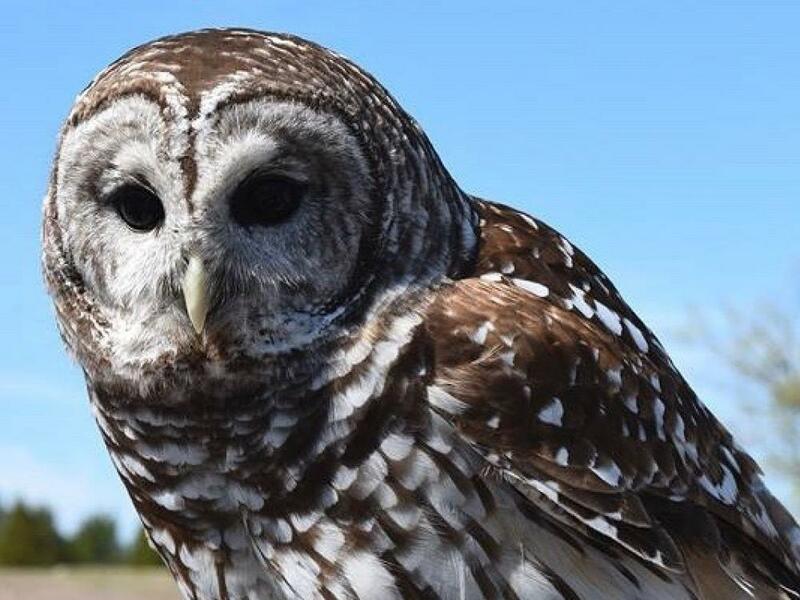 Other regular patients include American kestrels, Cooper’s hawks, red-tailed hawks and red-shouldered hawks, plus barn owls, barred owls and great horned owls and even vultures. Injuries include broken wings, punctures, gunshot wounds and poisonings. Collisions with cars and power lines are the cause of many injuries. Few injures are caused by other birds or animals. Orphaned nestlings and fledglings also receive treatment at the clinic. Volunteers wear attire that mask their identity so the young birds don’t assume these humans are their parents. “We may receive around 400 patients in our first year. This exceeded our expectations. That also means we are obviously filling a void that North Texas has had for some time,” said Erich Neupert, BPRC executive director. More than 80 percent of BPRC patients are released to the wild. Some simply don’t survive. The remaining unreleased are usually human imprints: infant birds raised by well-meaning people who lacked the skills, facilities and live mice required to train a young raptor to hunt its food. Imprints remain dependent on humans. At BPRC, after the bird heals it must graduate from Mouse School. Flight cages, screened enclosures the size of large bedrooms, allow the birds to exercise their wings and build strength. Live mice are placed in the flight cages. Raptors must show they can catch and eat them before being released to the wild. 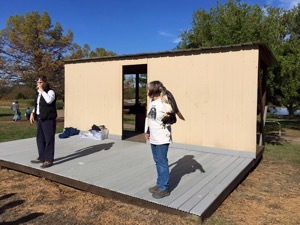 A newly constructed “mew” to house a raptor at the Blackland Prairie Raptor Center. Providing raptor rehab is not easy. Facilities must pass local, state and federal levels of regulations, which vary for each breed, with eagles having the most requirements. And it’s not cheap. It costs $10,000 per flight cage, even with volunteers doing the construction. The planned eagle complex will top $100,000. Raising live mice in the rehab clinic leaves it permeated by eau de rodent, so another item on the wish list is a separate building for that. BPRC came to be after Heard Natural Science Museum & Wildlife Sanctuary ceased their raptor rehab efforts. 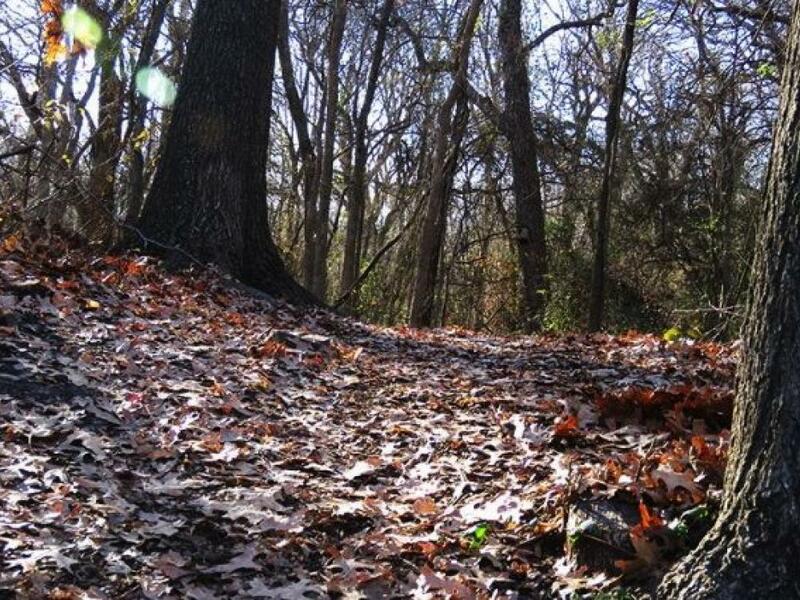 Its future began to coalesce in 2007 when the U.S. Army Corps of Engineers allowed BPRC to lease the defunct Brockdale Park, 66 acres on an inlet of Lake Lavon. Construction volunteers went into action, creating facility buildings, roads and pathways, plus an impressive pavilion with a hawk-shaped roof overlooking the lake. Boy and Girl Scout built a firepit and other public amenities. A vulture platform allows waste from bird feedings to aid the carrion feeders. On the first Saturday of the month, BPRC opens to the public with a presentation of their educational birds, rehabilitated raptors unable to be released that are also tolerant of being viewed. Many of these were human imprints. Together with their off-site presentations to groups, the center brings its mission to more than 30,000 people a year. 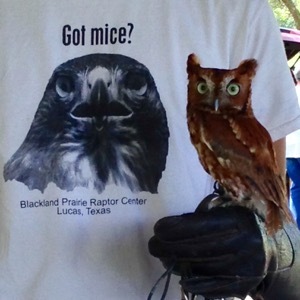 On this Saturday, joined by my owl-loving grandnieces, a dozen volunteers work the event in shirts boasting a raptor face inquiring “Got mice?” After a slide show on Swainson’s hawk, a migrator seen in North Texas, Pam Dancaster, BPRC resident bird care specialist, begins speaking about the birds. Volunteers wearing special arm gear walk the aisles. It takes years to develop rapport with a raptor, and only a few volunteers are allowed to show them. Visitors are able to get a glimpse of the birds from just a foot away. The raptors are stupendously beautiful up close with awesome eyes. Raptors are shown in order from day hunters, to those who work the crepuscular dawn and dusk hours, to night feeders. While presenters never give the personal names of rehabilitated birds so people remember they are wild and not pets (names are at the website) Dancaster shares the story of how each bird came to BPRC and relays fascinating facts. • Designers of jet engines studied the peregrine falcon, the world’s fastest bird, whose nasal baffles enable it to process air rushing in at 200 mph while in dive mode. • Mississippi kites eat only flying bugs. Formerly a cold-intolerant raptor that only migrated through, more are staying almost year round in North Texas due to rising temperatures. 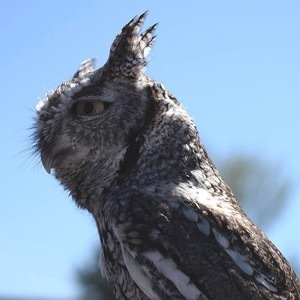 • The crepuscular screech owls, the “meanest bird we have,” says Dancaster, are gray if the eastern species and red if western. They dine on cockroaches, waterbugs, cicadas, grasshoppers and crickets. • Owl ears are on different levels to make locating of sounds more accurate. Barn owl ears are the most un-level. • Night feeding barn owls can hear a mouse’s heartbeat from 20 feet away. Its bowl-shaped face funnels sound, granting it the best hearing of all owls. Unlike other owls, it nests all year and can produce up to 16 owlets annually. They eat twice as much as a similar sized red-tailed hawk. • Barred owls, also nocturnal, have the widest range of sounds. They favor amphibians, snakes and other water creatures and patronize ponds and lakes. Education birds are kept separate from those undergoing rehabilitation due to disease issues. Thanks to volunteers and donations, they now have permanent quarters in a tricked-out barn. Enclosures the size of large horse stalls have indoor and outdoor space with room enough for bird to exercise their wings. Those unable to fly receive intricate ramp systems. 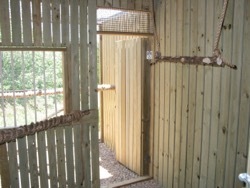 Spaces are customized for each bird and filled with enrichment aids like swings and toys to keep it interesting. 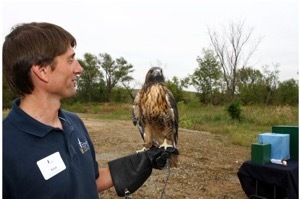 Neupert, part of the former raptor rehab crew at the Heard, has birds in his blood. Getting a permanent home for BPRC off the ground was arduous, over a decade in the making. Yet in that time, attitudes toward raptors changed significantly. It’s easy for individuals to help raptors wherever they are. “The best thing people can do is respect them and understand their importance to North Texas,” said Neupert. Raptor enthusiasts can put up a screech owl box. Barn and barred owls are quite amenable to nest boxes, though their placement must be rather high. Other suggestions include not using chemical pesticides and or rodent poison for pest control. Eating poisoned prey is a top cause of raptor death. Neupert remains intensely committed to BPRC. While fundraising continues for additional flight cages and an eagle complex, the center turns to enhancing its namesake. Native blackland prairie grasses are starting to thrive at the park, planted by volunteers from Prairie & Timbers chapter of Audubon and Blackland Prairie Chapter of the Texas Master Naturalists, aided by Rockwell-Collins, Inc. and Collin County Open Space, in hopes the prairie will rise again along with the raptors. If you find an injured raptor, call BPRC at 972-442-7607. Make arrangements to bring the bird to the center at 1625 Brockdale Park Road, Lucas TX 75002. Drop-off centers in tandem with BPRC include Eastlake Veterinary Hospital (214-342-3100) near White Rock Lake and Summertree Bird Clinic (972-387-4168) in North Dallas. Many municipal animal control centers will hold birds for BPRC.